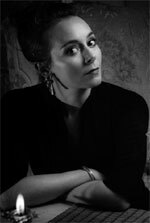 Described by The Times as a ‘delectable soprano and a serene, ever-sentient presence’, Anna studied at the Royal Academy of Music with Noelle Barker. Notable concert performances have included Britten’s War Requiem at the Berlin Philharmonie, a programme of Russian operatic arias with Philharmonia Baroque in San Francisco, Handel’s Joshua with Laurence Cummings at the Laeiszhalle Hamburg, Bach’s Christmas Oratorio with the Australian Chamber Orchestra in Sydney Opera House, Haydn’s Creation with Orchestra Ensemble Kanazawa in Japan, the Russian premiere of Thomas Adès’ Life Story at the Rachmaninov Hall in Moscow, and the modern premiere of Rameau’s Anacréon of 1754 with the Orchestra of the Age of Enlightenment. Her BBC Proms appearances include performances with the City of Birmingham Symphony Orchestra, the BBC Symphony Orchestra, the Britten Sinfonia and the Orchestra of the Age of Enlightenment. Anna twice created title roles in new operas at the Almeida Theatre—The Girl of Sand and Ariadne, both composed by Elena Langer, and more recent opera roles include: Emira in Handel’s Siroe (with Laurence Cummings), Paride in Gluck’s Paride ed Elena (with Andreas Spering), Katherine Dee in Damon Albarn’s Dr Dee, Ilia in Mozart’s Idomeneo and l’Ingrata in Monteverdi’s Ballo delle Ingrate, both directed by Graham Vick, premieres of Francisco Coll’s Cafe Kafka and Jonathan Dove’s The Walk from the Garden, Flora in Jonathan Dove’s The Enchanted Pig, Francesca in Edward Rushton’s The Shops, Moll Hackabout in Will Tuckett’s Pleasure’s Progress, Kyoto in Yannis Kyriakides’ An Ocean of Rain, and Strawberry Seller and Strolling Player in Britten’s Death in Venice at La Scala, Milan.